Debris is scattered across the landscape after a tornado went through Baker, Montana on June 11. Photo by Roger Meggers of Baker Air. 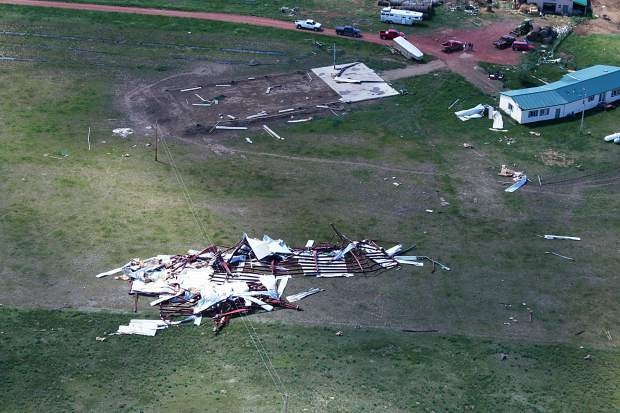 Several outbuildings at this home near Baker, Montana were destroyed by a tornado. Photo by Roger Meggers of Baker Air. 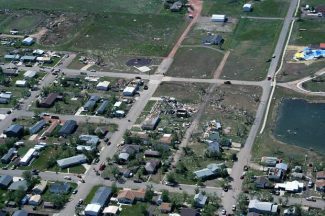 The path of the tornado in Baker, Montana is visible in this aerial photo. Photo by Roger Meggers of Baker Air. Nerves are typical for most contestants at the high school rodeo state finals, but not the kind of nerves that the athletes at the Montana High School Rodeo Finals were faced with on Saturday night. Midway through the tie-down roping, the announcer stopped the rodeo and told everyone to take shelter under the grandstands because a tornado that was headed their way. 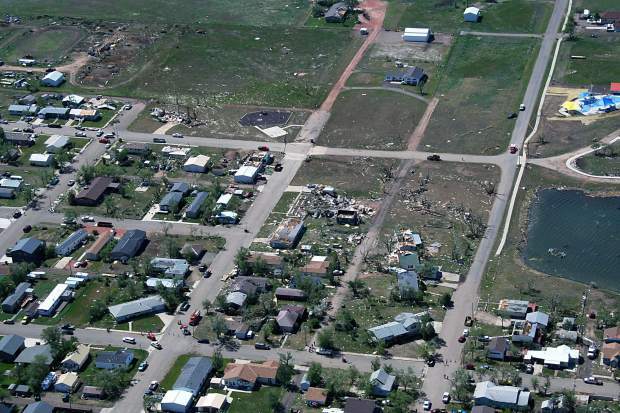 Around 7 p.m. the tornado touched down in Baker, Montana. "They were in the middle of the tie-down roping when the tornado touched down on the airport, so the rough stock and the roping stock ended up being left out in their pens and all the rodeo horses were put in the horse barn," said Martje-Jane Plaggemeyer, who won the state finals breakaway roping champion title that weekend. Plaggemeyer roped that morning and was only watching the night of the tornado. "When we were under the grandstands it was really, really weird because I was by a window and you could see the flag on the flagpole completely change directions a lot which was really weird. 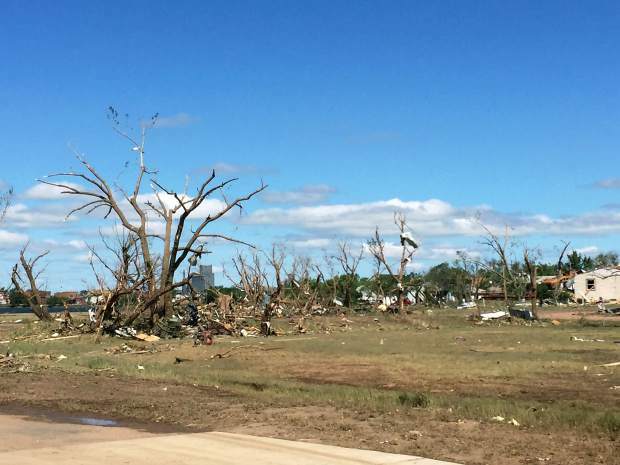 It was really crazy because Baker hasn't had a tornado in years," Plaggemeyer said. The finals resumed the morning after the tornado. Starting at 7 a.m., they wrapped up the rest of the tie-down roping, the breakaway roping and one more section of team roping and barrel racing, but the disruption didn't seem to affect the remaining competitors. "I didn't think it really made much of a difference for the members who had to wait till the next morning," said Montana High School Rodeo Association state secretary, Lisa Lappe. "They did great and we finished up in less than two hours. It did make it a little tough for the office to get prepared for the short round, but even with that things went smooth throughout the short round." Fortunately, the tornado missed the fairgrounds. No contestants, spectators, horses or rodeo stock were hurt and the finals finished out smoothly. 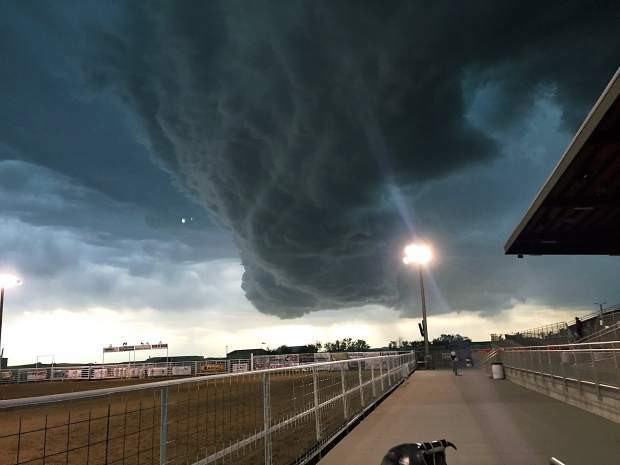 "The Fallon County fairgrounds did an awesome job of getting everyone to shelter and making sure they were safe, along with the livestock," Lappe said. However, not everyone was that lucky. 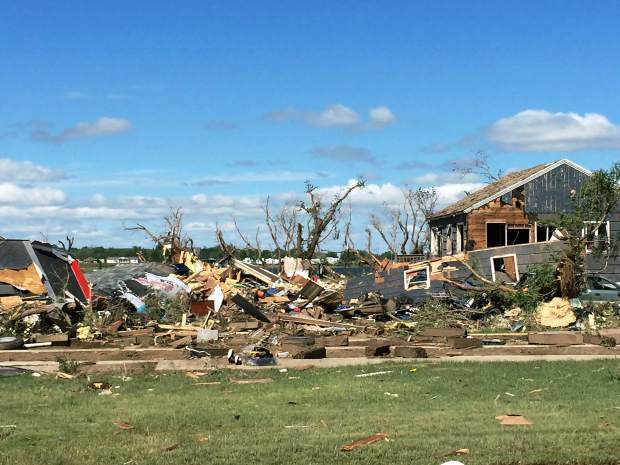 According to a storm survey conducted by the National Weather Service, six homes in Baker were destroyed and more than fifty were damaged. 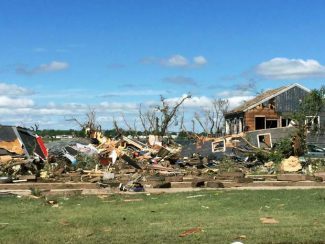 The tornado was classified as an EF-3 that tore through about a half-mile of town, northeast of Lake Baker. 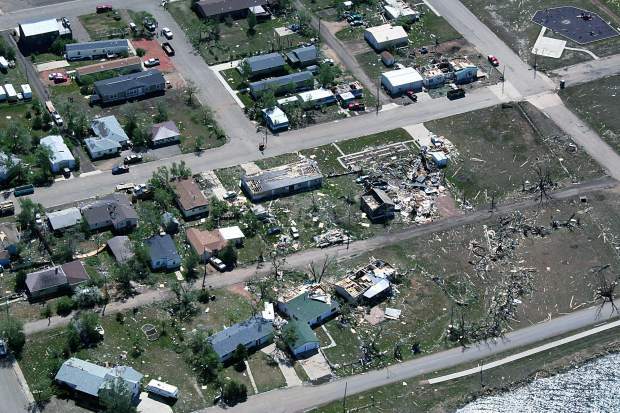 One family, the Hickeys, lost not only several structures, but also a horse and a roping steer. Several more of the family's horses suffered serious injuries from the storm as well. "We had to put one horse down and one roping steer was dead," said Chuck Graham, a close friend of the Hickey family who rushed across town after the storm to help out. "Another quarter horse was in pretty tough shape and had to go to the vet clinic, she's been there for three days, she had numerous lacerations. The vet was able to come out and doctor another horse on site. The barn was blown away, there were two horses still in stalls that we had to dig out but neither one of them were cut up, they were just scared." 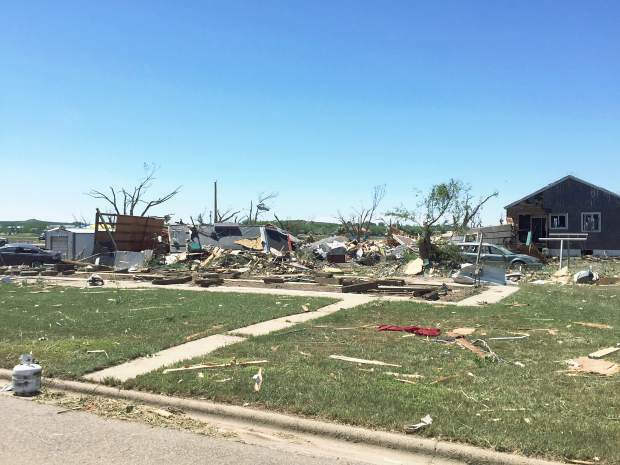 The strength and suddenness of the tornado didn't allow any time for homeowners or livestock owners to prepare for what was headed their way. "I was standing down on Main Street when I saw the rotation in the clouds," Graham said. "I saw the funnel come down and I saw the debris coming up from the ground and I would say that the tornado was on the ground for close to a minute before the sirens in town went off." Residents on the east side of Baker barely had time to get to safety. "I was on the phone with the Hickeys and they ran to the basement of his mother's house and he got his mom and son in a bathtub and he put a door over the top of them and laid on top of the door until it was over," said Graham. Once it was over the Hickeys walked outside to a devastating sight. "The Hickeys had a horse barn that was totally demolished, they had a couple loafing sheds that were destroyed, actually one of them is over laying in the lake. They had a hay barn that's just gone, nobody's even found it," Graham said. In the face of the destruction though, the small community of Baker is pulling together to help out their neighbors in need. "A large group of people from the community have come out to help and we spent all day Sunday and all day yesterday cleaning up trash and hauling it to the landfill. FEMA and the federal government have come in and are helping as much as they can, I think they are going to help with a lot of the clean up too," Graham said. Funds have been set up at the Bank of Baker and at the Summit National Bank in Ekalaka as well. 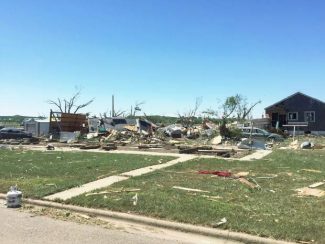 To find out how you can help, either monetarily or through volunteer time, you can visit "Baker Tornado Relief" on Facebook.